Here at NatraTex we’ve assembled our own expansive range of surfacing products that are ideal for a wide selection of decorative surfacing applications – especially coloured hard landscaping. Because our range of products expands to offer so many choices, it’s no surprise that there’s always a perfect choice of coloured surfacing material, no matter the task. You can click to view our our full range of NatraTex and NatraTex Colour coloured asphalt. When it comes to choosing a product for coloured hard landscaping, there’s really only one choice – Natratex Cotswold. Of all our coloured surfacing products, Natratex Cotswold is the most popular. 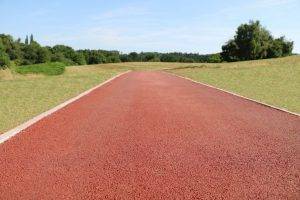 Once laid, it creates a long-lasting, beautiful surface course which is largely maintenance free and blends superbly with a range of landscapes. Natratex Cotswold is a testament to the quality of our products and makes us proud to say that our flagship material is the number one hard landscaping choice for the discerning specifier and homeowner. Our coloured hard landscaping is long lasting, maintenance free and gives a professional finish, making it an extremely cost effective option. Because of all these strengths, we genuinely believe that Natratex Cotswold is the best product on the market for paving coloured cycle paths. You can click to view our full range of Natratex and NatraTex Colour aggregates. Our team of dedicated staff are always happy to help, whatever the challenge. If you have any questions, queries, or for a personalised quote – get in touch!